Who dont know Nero ? i mean Nero (Burning Tool) not Caesar Nero ! This software can burn VCD (Data and VCD) burn DVD (Data and DVD) Copy VCD and DVD and if you have a Label Disk Printer, you can use the Label Disk Feature to make your own label disk and now in version 9 you can edit your movie in this software such as Convert, Split, Combine and make your own SlideShow in DVD format. 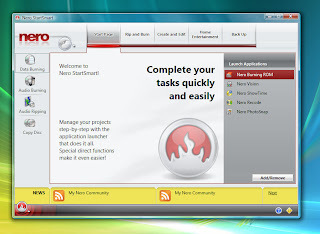 You can download the file setup for Ahead Nero 8.0.x in here and for Ahead Nero 9.0.x in here. before you download the file setup you should see the screen shot, to avoid the best quotation of my lecture Sinar Sinurat, ST "Malu bertanya, Sesak Nafas" <<< Translate to your language ! For Broken link or not working >> Comment !